Thinking Pinoy: Ohhh... Rappler is liable for Cyber Libel? Ohhh... Rappler is liable for Cyber Libel? 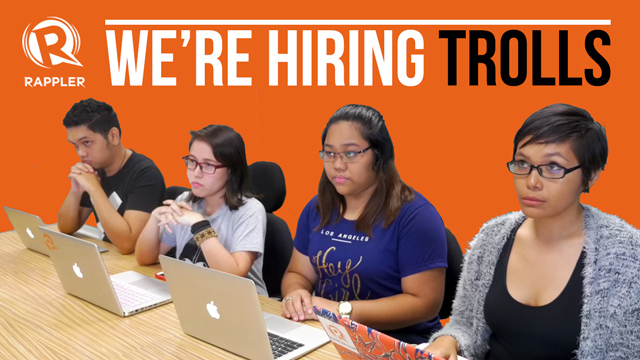 Last April Fool's Day, Rappler joked that they will be hiring trolls. Fast forward to August 2016, it appears that they weren't kidding. We suggest you sleep less and research more. 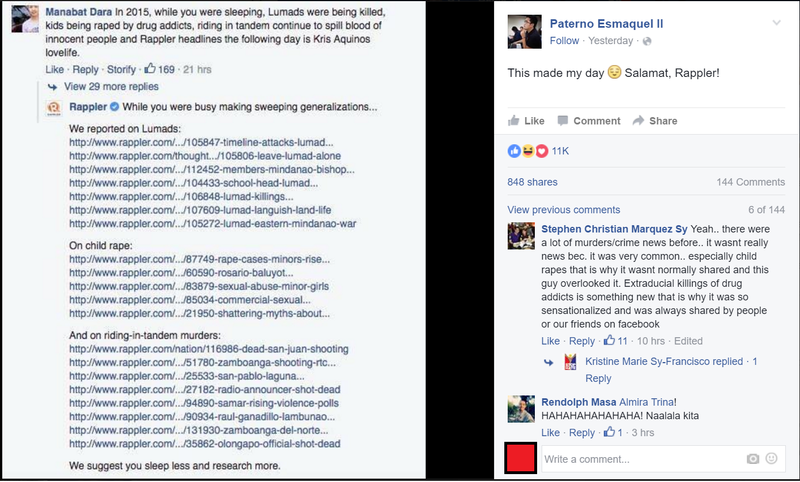 Paterno Esmaquel II's public post showing the exchange between Rappler and Manabat Dara. In fairness to Rappler, they did report about those three issues. The frequency in which they reported on the said issue may be questionable, but the fact of the matter is they did report on them, so Manabat Dara’s comment is, at least at first glance, ill-informed. What disconcerted me, however, was the way the moderator replied to the comment, because it goes totally contrary with Rappler’s moderation guidelines. In what world does “While you were busy making sweeping generalizations” and “We suggest you sleep less and research more” qualify as respectful? But it seems that Rappler personnel were not contented with one zingy comeback. Rappler really felt the need to single out the commenter – who is not a public figure – to feed their egos even more. Rappler multimedia reporter Paterno Esmaquel II felt that one humiliation is not enough for Manabat Dara as hammered the point with this public post on his verified Facebook account. Just four hours after posting, this entry has already received 11,000 likes and 848 shares.Yes, this appears to be Rappler’s definition of “respectful”. Alam niyo kasi, Rappler, okay lang naman sa akin na bastos kayo, bastos rin kasi ako e. Kaya lang huwag kayong umeksenang tila Birhen Mariang “respectful conversations” kunwari ang gusto. Hindi e, naglolokahan lang tayo sa ganyang drama e.
Rappler, let me remind you of what “bullying” means. This definition of bullying is the basis of the concept of cyberbullying, with the only major difference being the bullying is done online. FIRST, it’s pretty clear that defendant displayed aggressive behavior. The fact that the post was shared and liked thousands of times further exacerbates the situation. SECOND, Esmaquel posted the screenshot to create a negative environment with the intent of humiliating Manabat Dara, potentially causing distress upon the latter. THIRD, Rappler's Esmaquel qualifies as a public figures while Manabat Dara is just a lowly citizen. This shows both real and perceived power imbalance in Rappler’s favor. Rappler journalist Paterno Esmaquel II also qualifies as a public figure, as he even had the temerity to request for a verified Facebook account, despite having no more than 3,000 followers. FOURTH, the act was committed on Facebook, i.e. it’s online. Rappler has published several articles about Cyberbullying. Don’t you find it ironic that one of Rappler's people is a cyberbully himself? Unfortunately, an applicable anti-Cyberbullying law still doesn’t exist in the Philippines, so Manabat Dara cannot sue Esmaquel for such. The Anti-cyberbullying Act of 2013 [RA 10627] applies only to educational institutions, and the Anti-cyberbullying Bill of 2015 [Star] apparently wasn’t passed. Luckily for Manabat Dara, he may have another legal remedy available: he can sue this idiot Esmaquel for cyber libel. 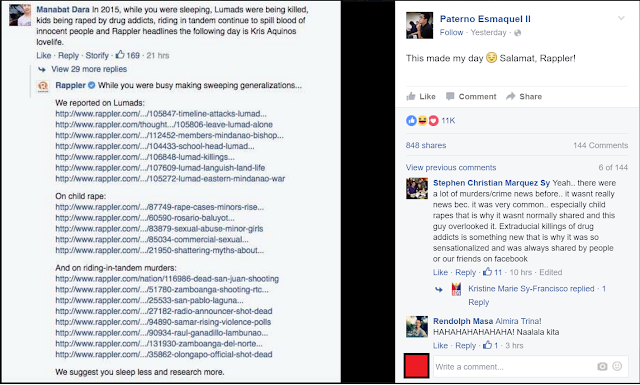 Did Rappler's Esmaquel just commit Libel? First Element: the post clearly seek to imply that Manabat Dara is ill-informed, that’s the defect, i.e. it was an imputation of a defect. Second Element: the post are viewable by the public, i.e. imputation was made publicly. Third Element: the post was against Manabat Dara, a natural person who even has a photo of himself on his Facebook profile page. Fourth Element: the post clearly intentionally humiliate Manabat Dara, i.e. they tend to cause the latter be publicly viewed with contempt. Now, we need to check for the Fifth Element: malice. Malice is defined as “the intentional commission of a wrongful act, absent justification, with the intent to cause harm to others” [LegalDictionary]. Clearly, the posts cause harm to Manabat Dara as they expose him to public ridicule. Now, the definition of malice requires the lack of justification, and Rappler may have the gall to use “we want to educate people” as an excuse. However, the fact that Esmaquel did not bother to blur Manabat Dara’s name and photo his post, clearly showing the intention to direct public attention not only to the issue, but also to the person. Yes, Manabat Dara can possibly sue Rappler's Paterno Esmaquel II for libel. Penalties for libel is Prision correctional in its minimum and medium periods or a fine ranging from 200 to 600 pesos, or both. This is in addition to the civil action which may be brought by the offended party, per RPC Art. 355. The length of imprisonment mentioned is from 4 to 26 months [SC]. An easy defense against libel is if the plaintiff (complainer) is a public figure [CCPC]. That is the same reason why I have blasted Aika Robredo, Karen Davila, Pia Rañada-Robles in my previous articles. That is also the same reason why I do not attack private persons. Thinkingpinoy does not vehemently attack identifiable persons who have no significant means to fight back. Rappler's people, however, do, as evidenced by the public humiliation of Manabat Dara, aa private person. Now, let’s analyze if Rappler's Esmaquel committed libel. Yes, Paterno Esmaquel, this will “make your day”. ThinkingPinoy finds it interesting that Rappler itself threatens abusive commenters. Don’t forget, libel is a criminal offense. It constitutes but is not limited to “malicious imputations that tend to cause dishonor or discredit anyone.” We have ways of knowing so be warned. That’s really funny, because that’s exactly what Rappler's Esmaquel did to Manabat Dara. Paterno Esmaquel’s cyberbullying described in this article clearly do not inspire community engagement, and it does not inspire “digital fueled blah blah blah”. Moreover, in light of his one-sided articles about the South China Issue, his journalism is already compromised. So that leaves us with the last item: that you are a group of veteran journalists. Rappler has interns but Paterno Esmaquel II is a veteran journalist, as his LinkedIn profile shows he was a part of GMA News Online and Probe Productions prior to joining Rappler. But with what he did, Esmaquel may not deserve the respect accorded to people labeled as such. Paterno Esmaquel, you are part of the Media Crisis. You are the reason why personal blogs like ThinkingPinoy gain attention, as the public's trust on mainstream media erode little by little with every biased article you write, and with every stupid Facebook status you post. UPDATE 1: Today, Paterno Esmaquel has set his posts to private. Rappler's Paterno Esmaquel has just set his posts to private. Oi, pangatawanan mo kalokohan mo. UPDATE 2: The original article mentioned a Facebook user who may have been one of Rappler's moderators. The Facebook user has denied being part of Rappler. To give her the benefit of the doubt, TP decided to delete all traces of her in this article. Hindi ako ganoon kataray.